There Is A War Waging For Your Soul – I Am Not Ashamed Of The Gospel Of Christ! 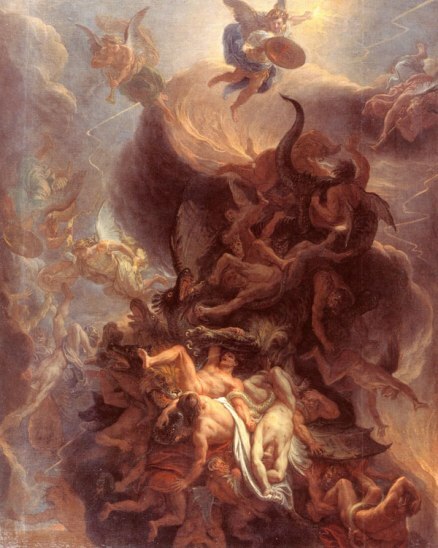 And there was war in heaven, Michael and his angels waging war with the dragon. The dragon and his angels waged war…. Let’s cut through all the sensationalism, and the so called ‘Conspiracy Theories’, all the sensational headlines about the ‘Illuminati’ and the Mark of the Beast and get right down to the nitty gritty. There is a major war being waged right now for the soul of not only those willing to follow satan, but full force for the believer. This is an ancient war that had it’s beginnings at the beginning of time. Even the secular humanist acknowledge this. Remember a popular socialist author who dedicated his book ‘Rules for Radicals’ to Satan. He said satan was the first rebel. Satan rebelled against God, he wanted to rule the universe. Before Adam and Eve, satan caused a rebellion in Heaven causing many of God’s Angels to follow Him to their damnation. This is laid out in the Old and New Testament. It’s not new. Satan destroyed or so he thought God’s creation by banishing them from God’s presence in the Garden of Eden and he has been on a rampage ever since. This war hasn’t stopped. It’s gained in momentum and speed and it’s hurling toward culmination. Culmination of God’s mystery as laid out by the prophets. Time is getting short for satan and he know’s it. Just look at everything that has taken place in the last say, fifty years. I have witnessed things that I never thought I would. When you can watch satan being praised in worship and song at an Internationally televised event like the Grammy Awards something is happening. When you can’t play a simple game without seeing images of evil and satan, and games that encourage spells, and curses, something is not right. When you see entertainers gleefully announce they sold their soul for their careers something is not right. When you see young people both famous and not, killing themselves slowly with drugs and alcohol, something is not right. When you see murder like Abortion being called good, and those who oppose it, being called evil, something is not right. When you see Powerful Nations decry that God’s law of marriage is evil and man’s lust after each other is good, something is not right. When you see God’s people in their churches announce that it’s a sin to call homosexuality a sin, something is not right. When you see whole churches preach doctrine that say’s there may be more than one path to God, and that the fear of God is not relevent, something is not right. When you see statues of satan and other gods being placed in our cities something is not right. Satan worked very hard to destroy God’s son, before he came to the world, while He was in the world, and he continues full force now before He returns to turn the Body Of Christ into chaos and division. There are whole bodies of believers falling in line with the false doctrines of the New Age teachers and those who say murder is OK, homosexuality is OK, and worshiping other God’s is OK. He has succeded in so many areas. This is not stories from the Bible that are nice to read, but we really can’t believe them. The belief that the Bible is wrong and not modern is not right. Satan is waging all out war to gain soul’s for his kingdom. The mark of the beast, think about it, all throughout the Bible God talks of a mark of His people. He even marked Cain so that he could walk safely on earth after killing his brother. 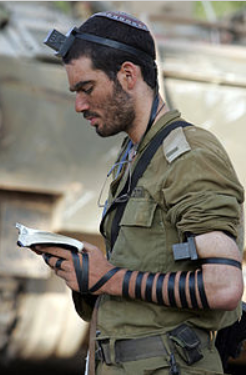 The Israelites were told to mark the words of their God on their foreheads and arms. This is why they wear the ‘Tefillin’ still today. Deuteronomy 6:8 And you shall bind them as a sign upon your arm, and they shall be as totafot between your eyes. Deuteronomy 11:18 You shall put these words of mine on your heart and on your soul; and you shall tie them for a sign upon your arm, and they shall be as totafot between your eyes. This marking is not new either. If you let the Bible interpret itself, you get a clear picture of what is taking place. There are also numerous places in the Bible where God again talks about marking those that belong to Him. Take Ezekiel chapter 9: And the Lord said unto him, Go through the midst of the city, through the midst of Jerusalem, and set a mark upon the foreheads of the men that sigh and that cry for all the abominations that be done in the midst thereof. And to the others he said in mine hearing, Go ye after him through the city, and smite: let not your eye spare, neither have ye pity…..
Then even before that, God marked His people, in Egypt while the curses were being carried out on the people of Pharoah. As God was preparing to smite Egypt for refusing to release the Israelites, He had them to put Lambs blood on their door posts for the Angel of Death to see and pass them over. “When a strong man, fully armed, guards his own house, his possessions are safe. But when someone stronger attacks and overpowers him, he takes away the armor in which the man trusted and divides up his plunder. “Whoever is not with me is against me, and whoever does not gather with me scatters. “When an impure spirit comes out of a person, it goes through arid places seeking rest and does not find it. Then it says, ‘I will return to the house I left.’ When it arrives, it finds the house swept clean and put in order. Jesus was fully aware of the power of satan and his demons. Jesus knew the battle that would ensue for God’s people. Jesus knew how wicked the world would become before He returns. He gave us a snapshot, complete with details in the book of Revelation. He gave us plenty of teachings and ammunition to battle this evil, but sadly we turn from this teaching, and thinking we are wise and can do it by ourselves we become fools just as the Bible say’s. These who think they are wise by gaining power from satan’s evil spirit are fools who have been deceived, man continues his Tower of Babel, a tower that God will destroy. Recognize this war that satan is waging, instead of reading stories, read how to combat this evil that has been unleashed on the world, arm yourself with the word of God. Jesus rebuked satan with the word, it is our only defense against the evil of satan. Mark your heart and mind and soul’s with the word of God, turn only to Him. As the world looks for a man ‘Antichrist’ the biggest lie being told to the Body of Christ is that JESUS IS NOT THE SON OF GOD. And it is being accepted world wide by BELIEVERS! It’s time for Christians to wake up and be about the Father’s business. The harvest is here and the workers are few. A very good and straight forward warning. Let those who will listen take it seriously. The LORD+ does not change. There is NO variation or shadow of turning in HIM+. There are still the 7000 that have not bowed the knee to baal or kissed his image. There are the 7000 left who will and do wield the Sword of the HOLY SPIRIT. As it says in Daniel, “those who know their GOD shall be strong and courageous. JESUS said, ” the works that I do my servant shall also do”(John 14:12-14). This can only happen among the “Called Out” faithful ones. The final battle is aproaching. Let us draw near to GOD. HE+ promises that when we do that HE+ will draw near to us. Live in prayer. Lift up your hearts. Keep your armor on! In JESUS our Life. AMEN! What an article to uncover the truth of the greatest imposter the earth has in it satan and his demon army trying their best to pull as many onto or keep those on the wide path of destruction by lightly saying as you so many times in article above states COME ON IT’S O.K. to do evil and think good will come of it. satan was the most beautiful creation God had and made the mistake to think he could rise above the throne of God himself and place himself there to rule! Very good article to uncover the one who Jesus himself said is a liar and the father of it.Don’t be deceived people, learn of Christ while you still have time for if you don’t the one vying for your soul may just win.God Bless all who strive to enter the narrow gate, for many find the wide road of destruction and few the narrow. Amen Julia!! Very well said. I can add nothing to your comment of truth. May God strengthen us in these last days against satan. Yes! There is no other name under Heaven that carries the power that the Name of Jesus carries!! I know sometimes it’s a constant battle, but we are covered by the blood of Jesus, and ‘The power in us is stronger than the power in the world.’ Keeping you in my prayers Ann, and God Bless you and keep you in His hands!